Roughly two dozen athletes take off at dusk from Donner Lake's West End Beach on Friday, July 28, for the annual full moon crossing of the lake. As darkness crept over Donner Lake on Friday, July 27, a group of roughly two dozen swimmers entered the waters off West End Beach for one of the area’s little known summer traditions. For the past half decade swimmers have met at Donner during a night lit by a full moon with glow sticks in hand for a swim across the lake. 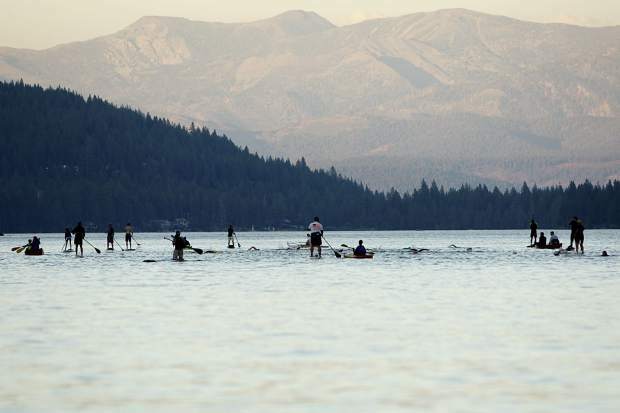 The swimmers are accompanied by a support crew on paddleboards and in canoes, helping assure a safe crossing of Donner Lake during the annual event.